Colorado has only four BLM managed wild horse herds–– all on the Western slope of the Rockies. I am guessing that the most visited one is Sand Wash Basin north of the little community of Maybell. And that’s where Quinn and I are headed. After we spend the night at my friend Lyn McCormick’s beautiful ranch on the Yampa River, we travel to the range. It's time for the Sand Wash Basin Rendezvous sponsored by the BLM and the Great Escapes Mustang Sanctuary (GEMS) and the GEMS volunteer unit, Sand Wash Advocate Team (SWAT). SWAT is responsible for monitoring the herd and for darting mares to limit reproduction so that few if any horses will need to be removed from the range in the years to come. What a turnout! Over 60 enthusiastic people, some from as far away as Canada. While SWAT and the many visitors help clean up old wire on the range, Lyn and Quinn and I play hooky. Along with our expert guide and photographer, Kathy Simpson, we head out to find wild horses. Around each bend and topping every rise it seems there are horses. In all Kathy thinks we see 150 Sand Wash mustangs, most of whom she knows by name. Many are within walking distance and we hike out onto the sandy hills. Because the herd is so accustomed to seeing respectful humans, they may glance our way, but seeing we are only two-leggeds, they go about their business of sleeping and eating. And from the looks of them, they haven’t missed many meals. They are plump and that’s good because winters in the Sand Wash Basin can be brutal. But before winter sets in this year, bait traps will be set up and 50 young horses will be removed. 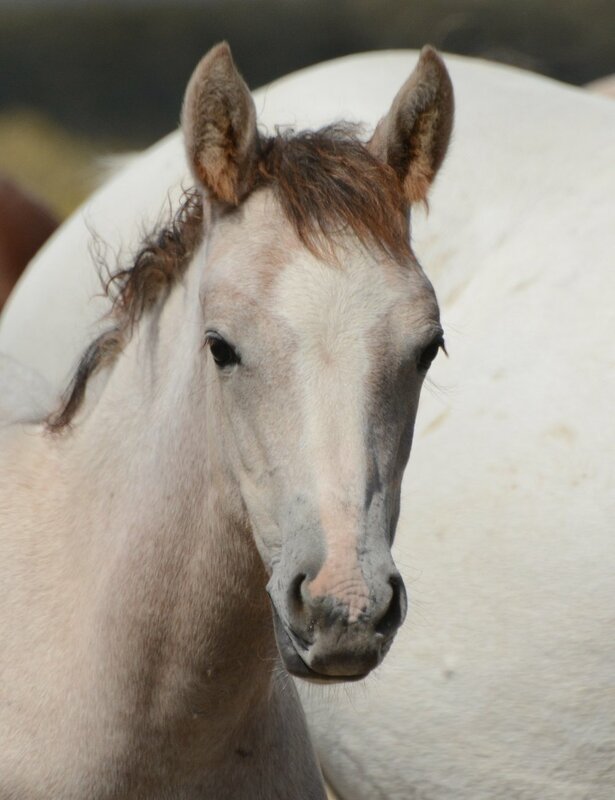 While it is sad to see any wild horse lose his freedom, these young horses, mainly yearlings and two-year-olds, will have a great chance to find good homes because they will be going to GEMS east of Denver. The colts and fillies will be halter trained and offered for adoption. Kathy spots more bands and we hike out to see the granddaughter of the famous paint stallion, Picasso. The whole band is beautiful and their sorrel stallion is more attentive than most, giving us the “you are close enough” stare as we back away. The paint filly finally wakes up from her nap and when she stands up we get a good look at her. What a flashy girl you are, I think to myself. I hope she might be allowed to live free so she can pass on her remarkable color and markings. Near the end of our drive Kathy points out a distant paint mare and foal in a deep valley. When they make their way uphill toward us, I get a good look at the beautiful grullo stallion following the mare and foal. Kathy tells us they have been recently stolen and it is apparent. When the stallion drives her, she resists. Kathy will have to let us know if the stallion holds onto the flashy mare and her baby. On my drive back home, I think about this wonderful day. I wish all wild horse herds were so lucky—committed volunteers to help manage the horses on the range and a committed place for any that lose their freedom to be trained and likely adopted into great homes. 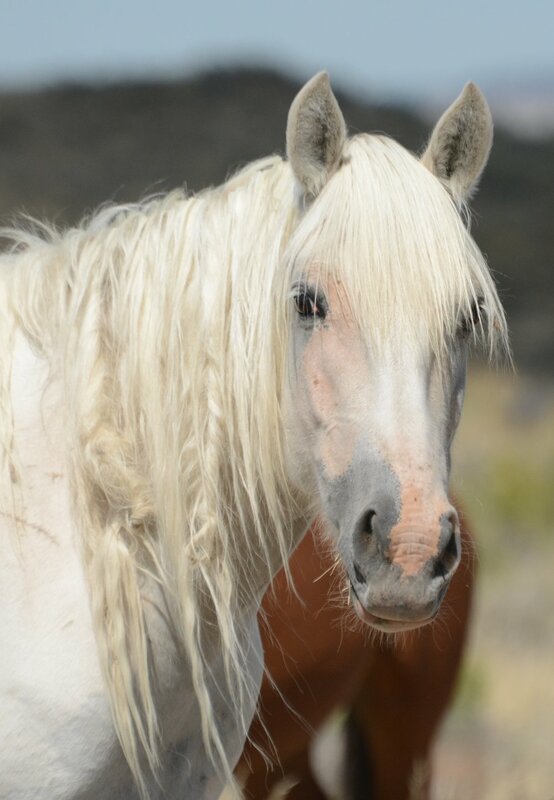 Of course, it is our ultimate goal that all wild horses live their lives in freedom with their families as Cloud was so privileged to do! P.S. Many of you know that I take my lively Irish Terrier, Quinn, on many of my road trips. He is well-behaved, but only allowed to be off-leash when we're far away from the wild horses. And if the horses are close, he is accustomed to staying in the car or the UTV. My goal is to be ignored so I might observe the interesting social interactions of the mustang families, behavior unaltered by my presence.